Environmental planner Aldaron Laird specializes in sea level rise vulnerability assessments and adaptation planning, specifically in the Humboldt Bay region. 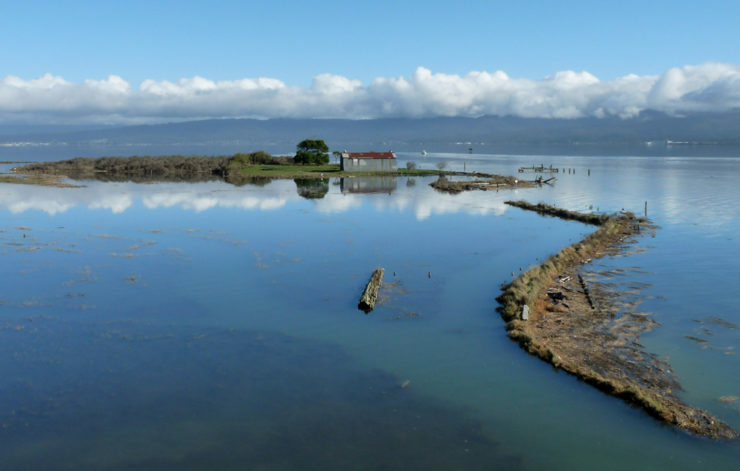 In this lecture, he will highlight the significant changes we might see on Humboldt Bay with just 2.0 meters of sea level rise – which could occur between 2070 and 2100, based on new probabilistic projections. Laird will discuss the associated challenges for land and water use, transportation and utilities infrastructure, and cultural and environmental resources. Aldaron Laird helped create the first baseline vulnerability assessment of the Humboldt Bay shoreline, and was the lead planner for the Humboldt Bay Sea Level Rise Adaptation Planning Project. Recently, he authored a portion of the 4th California Climate Change Assessment that described sea level rise vulnerability and adaptation opportunities on the North Coast. Laird serves as co-chair of the Sea Level Rise Initiative at HSU.